The proposed Museum will include two main structures, one outside state prison property, the other within its walls. THE 1936 POWERHOUSE will house the exhibition galleries and meeting spaces. Located just outside the prison perimeter, this plant once produced all the coal-powered electricity for the prison, including the electric chair. After an extensive renovation, the four-story Art Moderne building will feature soaring, light-filled exhibit spaces, theaters and meeting rooms, and a rooftop gathering space with expansive views of the Hudson River. THE 1825 CELLBLOCK, the oldest building at the pris-on, is a spectacular ruin, six stories high, 476 feet long and 44 feet wide. It once contained 1,200 tiny cells. Abandoned in the 1980s, the Cellblock is in remarkably stable condition, reflecting the workmanship of the convicts who built it using stone quarried on site. Since the Cellblock is on the prison grounds, the plan is to connect it to the Powerhouse exhibits via a 400-foot corridor. Visitors will follow security requirements, then leave the Powerhouse through the corridor to the interior of one of America’s most historic structures. The 1825 Cellblock will be the Museum’s most compelling and memorable artifact. I​magine taking a boat ride “up the river” to Sing Sing just as prisoners did in the early 19th century. Or riding in a train car that’s a period reproduction of one that transported prisoners here from New York City 80 years ago. Or seeing how long you can endure standing in a cell not much bigger than a yoga mat. Multimedia exhibits and hands-on experiences will take visitors from the prison’s early days as the “House of Fear” through to today’s more-progressive institution. By the time they leave, visitors will have seen, heard and felt the Sing Sing Prison experience. What’s more, they will take away new insight into crime, punishment and reformation. Sing Sing Correctional Facility remains home to about 1,700 men serving time for felony crimes. There will be no contact between prison residents and museum visitors, who will be expected to conform to required security procedures and to behave in a fashion that respects the residents’ rights and those of the families visiting them. From 1840 to 1877, a women’s prison stood on the grounds, above the main cellblock. This little-known chapter of Sing Sing history will look at the specific needs of female prisoners, efforts to reform them and why the experiment failed. From Alias Jimmy Valentine (1915) to Analyze This (1999), Sing Sing has been immortalized in countless movies and shows. The greatest artists and athletes have found inspiration here, from Babe Ruth to Houdini, Walt Whitman to Andy Warhol, Bessie Smith to Bruce Springsteen, whose grandfather served three years in Sing Sing for embezzlement. The original cellblock is unlike any other building in America, and visitors will have an unforgettable experience. Through physical displays, interactive technology and virtual reality, they will learn about the conditions of incarceration for 1,200 men (though usually more) for more than a century. Knowledgeable guides will bring its history and architecture to life. Every year Sing Sing Corrections Officers commemorate the death of one of their own during a deadly escape in 1941. It takes a small army to keep Sing Sing Prison working, and the job is not easy, safe or often appreciated. Yet the corrections officers can play a key role in the rehabilitation of inmates at Sing Sing. The Sing Sing Prison Museum will offer a realistic account of the challenges that the corrections officers, staff and volunteers deal with on a daily basis. 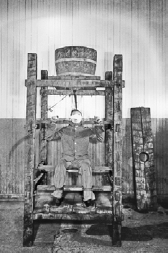 Promoted by Thomas Edison and billed as a more “humane” means of execution than hanging, the electric chair held sway at Sing Sing from 1891 to 1963. A guided journey will take visitors from the process of execution, into a re-created “death house,” and tell the stories of some of the 614 prisoners executed there, including convicted atomic-age spies Julius and Ethel Rosenberg.